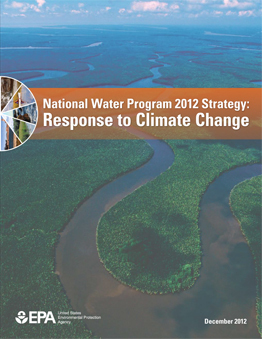 EPA has released the “National Water Program 2012 Strategy: Response to Climate Change,” which describes how EPA’s water-related programs plan to address the impacts of climate change and provides long-term visions, goals and strategic actions for the management of sustainable water resources for future generations. The strategy, which builds upon EPA’s first climate change and water strategy released in 2008, focuses on five key areas: infrastructure, watersheds and wetlands, coastal and ocean waters, water quality, and working with Tribes. It emphasizes working collaboratively with partners and stakeholders, developing information and tools, incorporating adaptation into core programs, and managing risks of impacts including from extreme weather events. The 2012 strategy also includes goals and strategic actions for EPA in 10 geographic climate regions. For more information, please visit http://www.epa.gov/water/climatechange.